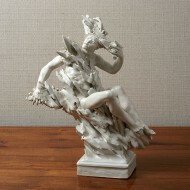 This ceramic figure of a naked moor who appears to be emerging or metamorphosing from a jagged rock formation is a very baroque example of SpadiniÃ¢ÂÂs work at its most Berniniesque; and the miniature sculpture appears to be blown by the wind. Andrea Spadini (1912-1983) was perhaps the most talented Roman sculptor of the inter- and post-war period. As a boy he accompanied his father, the painter Armando Spadini, to see the sculptures and works of art in the Borghese Gallery in Rome. The statues, particularly those by Gian Lorenzo Bernini which he saw for the first time at the age of seven, made a deep and lasting impression on him. Above all, Bernini's statue of Apollo and Daphne which he described in an interview in 1951 as "that group which it was almost impossible to conceive had been wrought by the hands of man" was an influence on him throughout his life, as was the Fountain of the Four Rivers in Piazza Navona in Rome, which he discovered with his father as they strolled around the city at sunset. Spadini's work is reminiscent of the Sicilian sculptor and decorator Giacomo Serpotta (1656-1732) and he was influenced by the Surrealist painters Salvador Dali and Giorgio de Chirico. From 1925-29 Spadini studied sculpture in Florence. The chief characteristics of his sculptures are the playfulness and sense of humour which permeate his work and his accomplished technique. In his ceramic figures Spadini aspired to creating objects "that moved or appeared to be blown by the wind" such as he had observed in Bernini's sculptures. He succeeded when, in 1951, he made his first ceramic sculpture to disguise a clock which he had purchased from a department store. "I modelled a rock and St Jerome and the lion, with an angel peering down curiously on the pair from above, and when it was done, I placed the clock inside it¦"
In the same year, he finished his first important commission, the decoration of the exquisite Villa Cicogna in Venice, collaborating with the surrealist visionary architect, Fabrizio Clerici. Countess Anna Maria Cicogna, who was born into the highly influential Volpi family, chose the 19th century dwelling of an English clergyman in a beautiful part of Venice, next to the Church of Santa Maria della Salute. The unattractive structure was demolished and rebuilt, and the interior was recreated with an ensemble of decoration reflecting in all its details the grand period of the Venetian 18th century. Walls, pavements, staircases, ceilings, doors and windows, installations of all kinds, were added, on the tasteful and well-balanced designs of Clerici, inspired by the great Venetian churches, museums and palazzi, including a ceiling painted in the style of the 18th century master Giovanni Domenico Tiepolo. Spadinis first exhibition in New York was in 1960 at the Sagittarius Gallery, followed by an exhibition at the Wildenstein Gallery. Here he met Van Day Truex, who proposed a collaboration with Tiffany & Co in New York. Tiffany & Co introduced Spadini's work to America in an exhibition in May 1960, dedicating a room to his luxurious, "surprising" ceramic table decorations. Each group of six figurines averaging 11 inches in height sold for $750 and were described in the New York Herald Tribune as "these rare and imaginative objects modeled by Spadini's gifted hands." In an article in "Il Giornale Nuovo" in 1983, the artist and decorator Piero Fornasetti commented, "Like a true sculptor his bronzes, waxworks and ceramics, can be admired from all sides and each side is complete." Echoes of Bernini's Rome are obvious in details such as the tassels, inspired by the canopy in St Peter's, and the ornate vegetation which adorns the chimneypiece made for the home of Hollywood legend Henry Fonda in 1960. Spadini's growing list of American collectors included Carmel Snow, Clare Boothe Luce, Ambassador in Rome from 1955-57 and Lauren Bacall. In 1965 the publisher and philanthropist George T. Delacorte (1894-1991) donated a monument, the four-foot-high musical clock made of bronze to New York's Central Park Zoo. He conceived of the clock as a modern version of belfries in churches and city halls dating back to the Middle Ages. Spadini was commissioned to make bronze sculptures of a selection of gleeful animals including an elephant, bear and hippopotamus parading with different musical instruments on a carousel that rotates around the clock. It was unveiled in a ceremony in June 1965 by Mr Delacorte's two grand-daughters and to this day remains one of the best-loved monuments in Central Park, and an enduring testament of the wit and spontaneity that imbues Spadini's work. Good. Some small pieces of rock work missing. From a private collection in Italy. For more information or to arrange a viewing at Langton Street.